These stainless steel stemless wine glasses are a great modern take wine enthusiasts everywhere will appreciate. Made with a double wall construction so that body temperature does not affect the contents of your glass, and a flat bottom to avoid it from tipping over, these can be custom printed with your logo design, business name or event date. Sit back, relax, and allow these shiny personalized stainless steel stemless wine glasses steal the show. These will do wonder’s at grand openings, gala events, wedding receptions and more. Free Shipping available on select orders. Great finish and ink quality. Love the insulated execution. Lots of good feedback from recipients. 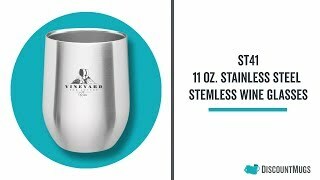 The double walled "wine shaped" stainless steel cup was fantastic! The printing of the boats logo was excellent! Very professional and exceptionally prompt delivery. Overall....EXCELLENT!!! excellent wine glass style,lettering,and keeps wine at nice temp. Amazing quality, very different that a normal wine glass and our customers love it. The double wall is great, keeps white wine cold longer!